Kerrin McEvoy will saddle up early Caulfield Cup (2400m) favourite Youngstar on Saturday, but admits he is wary of Darren Weir’s promising New Zealand gelding Night’s Watch ahead of the $5 million race. Night’s Watch, above, is aiming for a maiden Group 1 win in this Saturday’s Caulfield Cup. “I’ve got a pretty high opinion of a horse of called Night’s Watch, one of Darren Weir’s,” McEvoy told RSN’s Racing Pulse on Tuesday morning. Night’s Watch, who ran sixth in the Caulfield Stakes (2000m) last weekend, enters on the third-line of betting with Ladbrokes at $11.00. 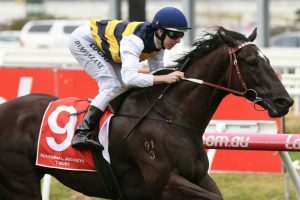 The five-year old already has two wins to his name this Spring, including an impressive come from behind victory in the Group 3 Naturalism Stakes (2000m) at Caulfield close to a month ago. “And obviously Lloyd Williams and Aiden O’Brien have got a strong team, the horse Hughie rides (The Cliffsofmoher) is going to be a decent chance as well” McEvoy went on to say. What Night’s Watch and The Cliffsofmoher have over some of their rivals on Saturday is track experience. Night’s Watch has raced at Caulfield four times now across his four-year career, while O’Brien’s five-year old enjoyed a fourth placing in the Caulfield Stakes last week. But even so, McEvoy insists Youngstar’s unfamiliarity with the Melbourne track won’t pose any problems. “She seemed well, she got round there nicely,” McEvoy said after working Youngstar earlier this week. Although the talented Group 1 winner is yet to record a victory since taking out the Queensland Oaks (2200m) at Doomben back in May, Youngstar has been well placed in her last two starts this prep. She finished third in the Group 2 Shannon Stakes over 1500m three weeks ago, and enjoyed the extra distance beyond the mile in the Group 1 Turnbull Stakes (2000m) a fortnight ago at Flemington finishing second behind Winx. Of course, there’s no shame in finishing runner-up behind the mighty mare, and as it so happens, the times don’t lie – Youngstar ran the second fastest final furlong of the race. “She was luckless in the Shannon Stakes at Rosehill without too much room over 1500m, second up and third up was great improvement out to 2000m second to Winx, which is good form going into a Caulfield Cup when you’re dropping down in weight even more” McEvoy said when asked on Youngstar improving. Youngstar opens as the co $5.50 favourite alongside another of Weir’s runners in Kings Will Dream, but McEvoy still thinks his ride is showing all the right signs to put up a fight. The Cliffsofmoher sits on the second-line of betting at $7.00. Full Caulfield Cup Odds can be seen below.